I've sampled the cooking of all three official Executive Chefs at Patina ever since the restaurant moved to Downtown--Theo Schoenegger, Tony Esnault, Charles Olalia--so a visit to give the newest a go was certainly called for. Paul Lee joined the team at the end of year and officially took the reins at the storied restaurant in January. Meanwhile, GM duties are still handled by Kevin Welby, while Silvestre Fernandes remains as head Sommelier. About the Chef: Lee was born in Taipei, and came to the US when he was 10. He grew up in Irvine, and began experimenting in the kitchen with his grandmother during this period. Following graduation from University High School, he attended Cal State Fullerton, majoring in Entertainment Studies, and eventually found himself at the California School of Culinary Arts in Pasadena. Lee completed his degree there in 2006, and immediately secured work as a chef de partie at LA's iconic L'Orangerie. The restaurant closed later that year though, and he ended up moving to Las Vegas to take on a position at Joël Robuchon. 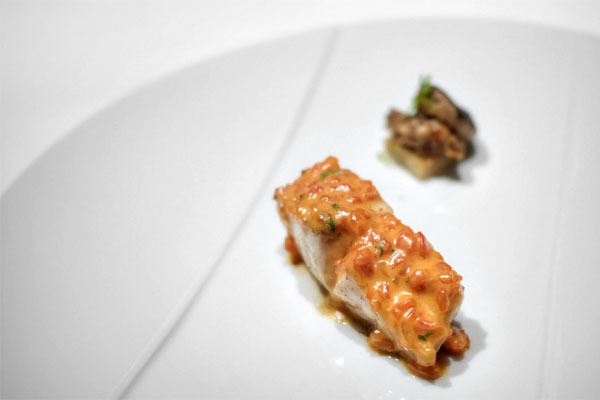 In 2009, he relocated to New York and cooked under Gregory Pugin at Veritas, then became sous at L'Atelier de Joël Robuchon at the Four Seasons. 2011 saw Lee return to Vegas, where he rejoined Pugin as exec sous at Bellagio's Le Cirque before taking on the EC role in January 2013 following his boss' departure. 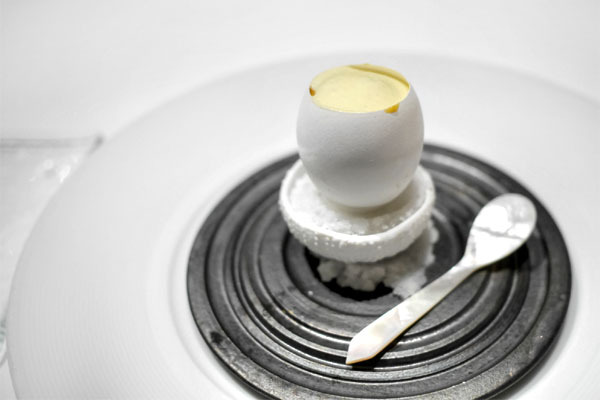 He left the French eatery in the middle of 2014, then proceeded to stage at Martin Berasategui's eponymous restaurant in Basque Country. Lee was recruited by the Patina team in September 2014 and was made head chef in January, replacing Charles Olalia, who left to helm the kitchens over at Terranea's Mar'sel (a post previously held by Michael Fiorelli of Love & Salt). Inside, things were pretty much the same as what I encountered on my last visit, and my visits before that. It's a handsome room. Lee's ascendancy has also brought about a change in the menu, which is prix fixe-only now. You can get three courses for $79, five for $110, and eight for $150. 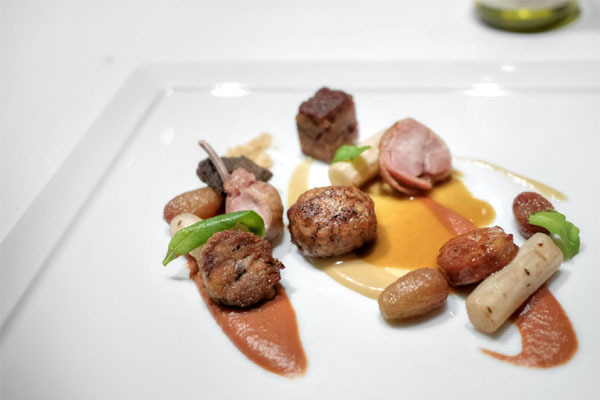 We opted for the longest tasting menu, and tacked on two three-coursers to share so that we could try more of the food. Click for larger versions. 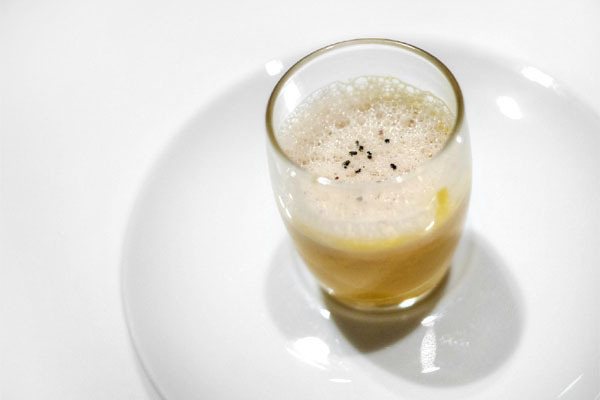 We were soon provided an amuse bouche of sorts: a carrot soup topped with chicory foam. I found it appropriate for the season, with lots of spicy, autumnal, warming flavors over a base of sweetness, the finish giving off lots of anise-y notes from what may have been caraway. 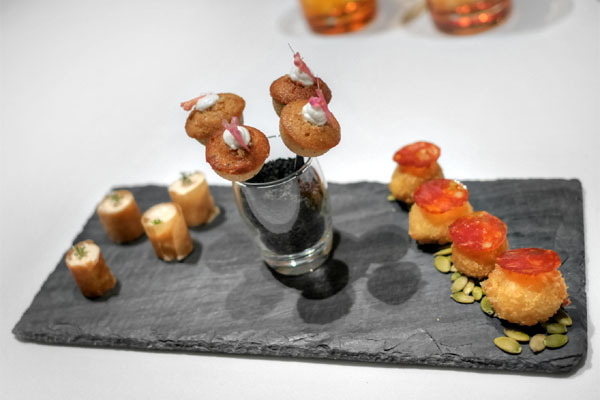 Next came a tray of canapés to share. 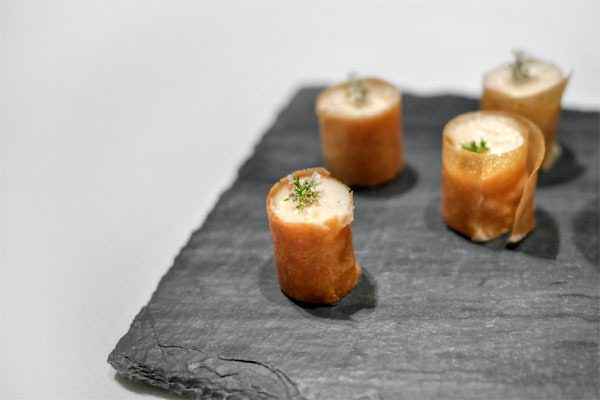 Smoked salmon mousse was topped with cilantro flower and encased in filo. Very nice, with the briny, fatty fish pairing well with the crispy, brittle, savory dough. 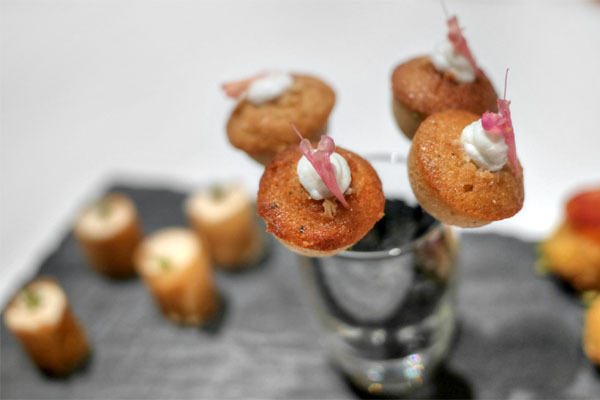 Miso-almond financiers came crowned with goat cheese and edible flowers. Intriguing savory sweetness here, with an earthy miso presence. 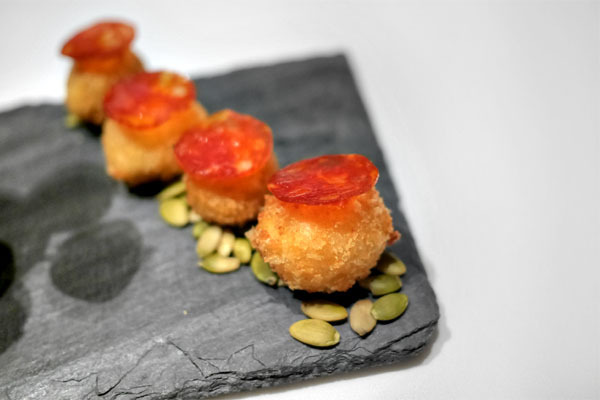 My favorite of the bunch was the butternut squash croquette with chorizo. I appreciated the rich, creamy, not-too-sweet nature of the squash, and how that balanced out the spiciness from the sausage. 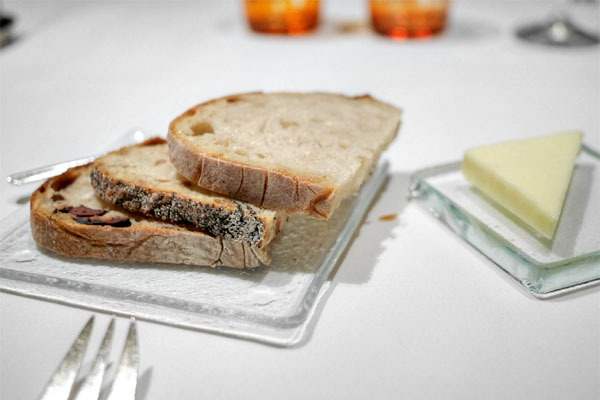 Bread service comprised a classic country; a rustic, nutty cornflower and seed; and a restrained olive variety. 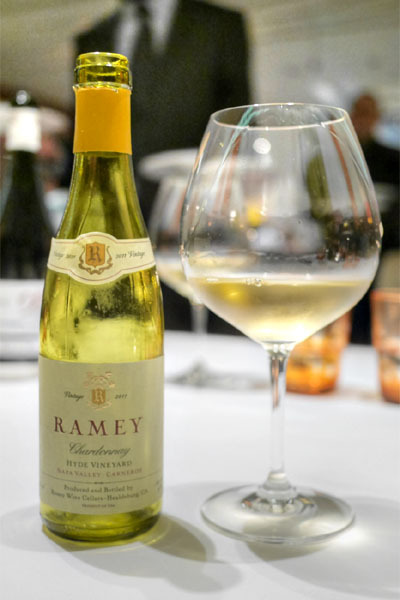 A powerful white wine was appropriate, and we chose the Ramey, Chardonnay, Napa Valley-Carneros, 2011 [$68]. I quite enjoyed this one, getting lots of tropical fruit intertwined with buttery, oaky influences and an almost candied quality and trace of barnyard. 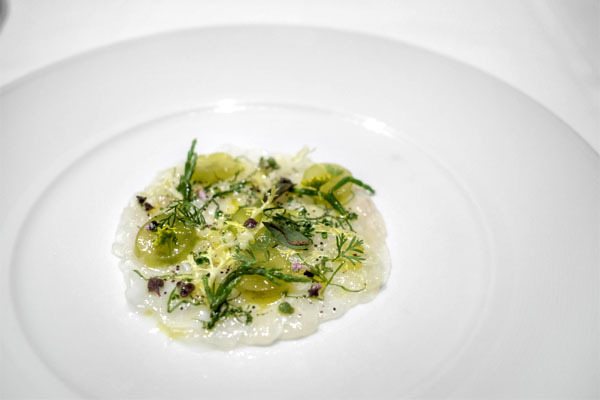 Our first proper course presented sea bream, a super clean, tight, focused preparation of the fish that balanced the potency of olive oil with contrasting notes of sweetness, salt, and spice. An effective combination of flavors over a base of bream, and a promising beginning to the meal. 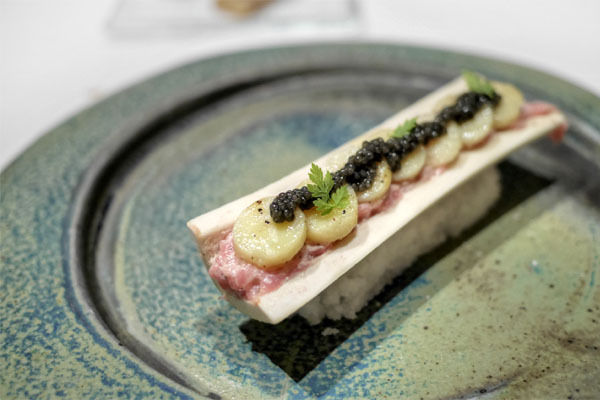 A veal tartar came out creamy, delicate, its subtle, tonnato-laced flavors ratcheted up by salty caviar while potato medallions provided textural contrast. 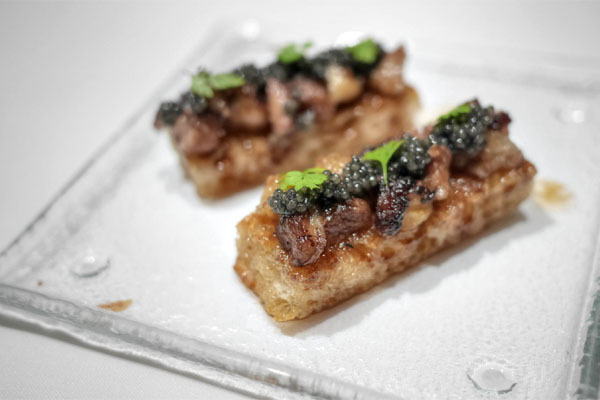 It was accompanied by bone marrow crostini--some unabashedly rich, lush, buttery pieces of toast that served as a foil to the relatively restrained tartar. 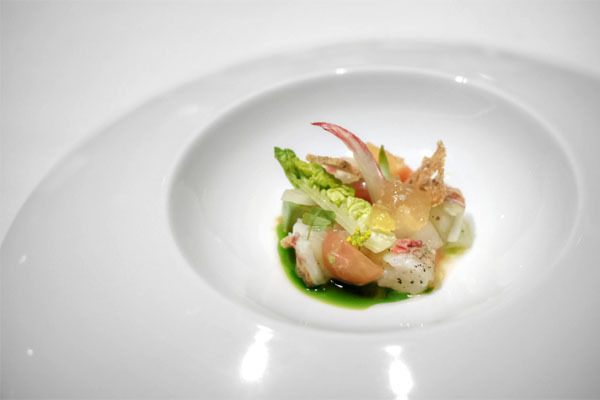 The lobster seemed to be a table favorite, arriving texturally perfect, all crisp and snappy to the bite. 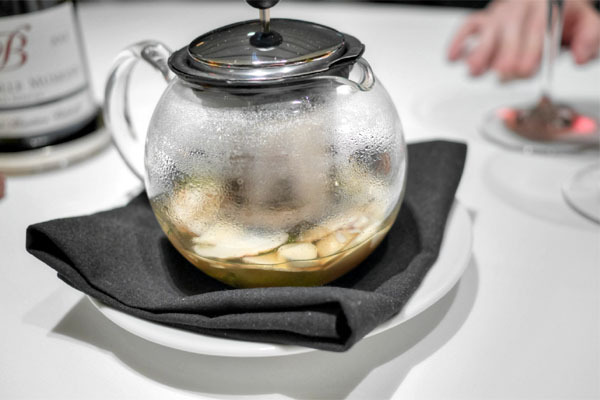 Flavors were clean, saline, well-matched to the bright, acidic influences from the veggies while a tomato dashi tied it all together and lingered long with notes of umami. Excellent crunch and spicy savor from the rye chips as well. A classically-leaning dish made for some delicious egg on egg action, with the star ingredient joined by complementary thrusts of sweet, salty, and tangy from the herbs. 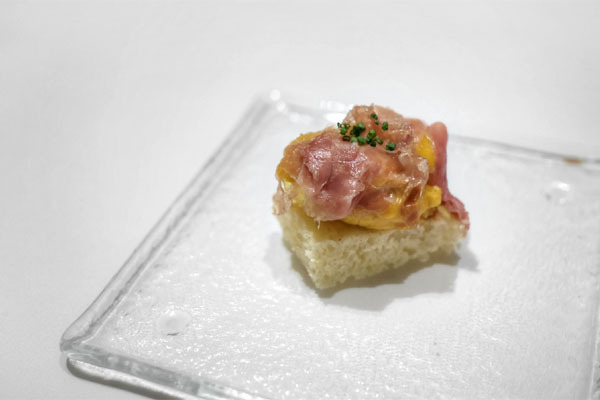 Also joining the mix was a silky French omelet draped with hammy jamón ibérico, atop toast. I don't have foie too often these days, so this was a bit of a treat. It was just as you'd want, all slick and soft with a nice crust and boatloads of liver-y goodness. 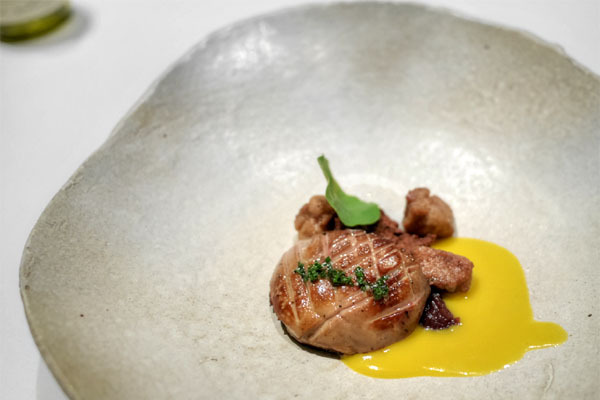 I was concerned about the kabocha, but its sweetness was just right for the application, and the nuggets of sweetbread were a great accent as well. A dish that really tasted of the season. One of the best escargot dishes I've had was next. 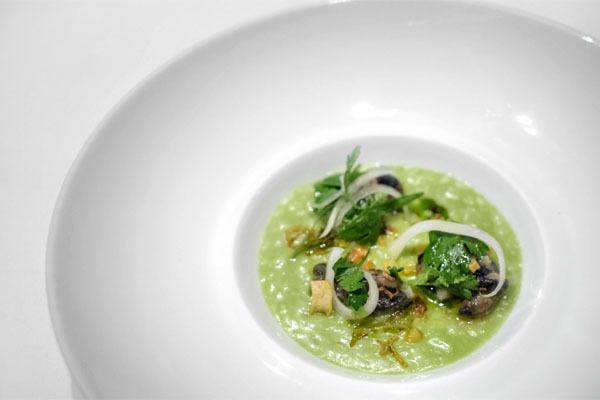 Snails were meaty little morsels, buttery and rich, yet beautifully paired with a bevy of herby, vegetal flavors and a whisper of anise. Striped bass was firm and flaky, its mildly savory flesh tart up by the tangy, tomato-enhanced béarnaise. In the background was a super savory, wonderfully crunchy potato terrine with ibérico-infused porcini. 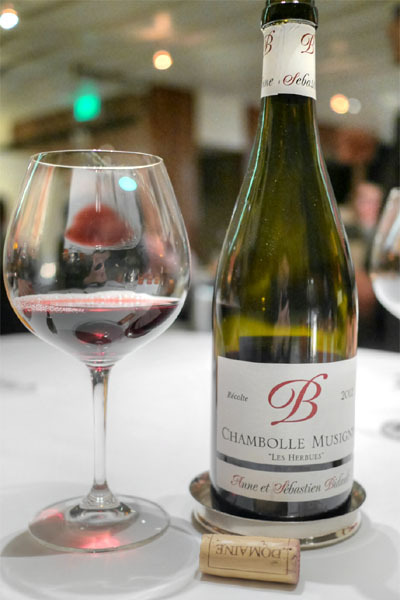 Time for red, and we went for the Chambolle Musigny, Pinot Noir, Anne et Sebastien Bidault, France, 2012 [$115]. Nose of dark fruit, forest floor, and booze. Taste offered up light berry notes over a strong tannic backbone, with whispers of violet coming through as the wine warmed. 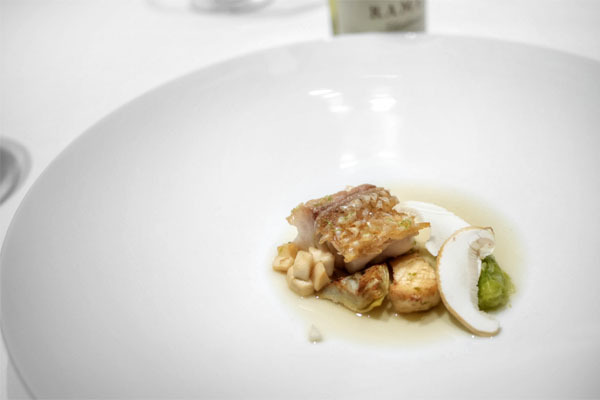 The tilefish was superb thanks to its wonderfully crisp skin, and its delicate flavor profile matched well with the earthy, fragrant matsutake broth. Given the texture of the skin, this actually reminded me of a sea bass dish that I'd had at Guy Savoy. 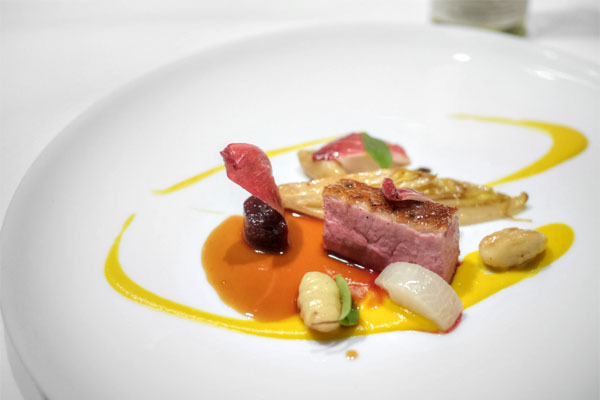 Getting into our more substantial courses now, the duck came out very robustly flavored, a massively savory preparation tempered by the bitter daikon and potato gnocchi while the butternut purée and orange-port reduction offering a warming, sweet spice. My only quibble was that parts of the bird were a touch chewier than I would've liked. 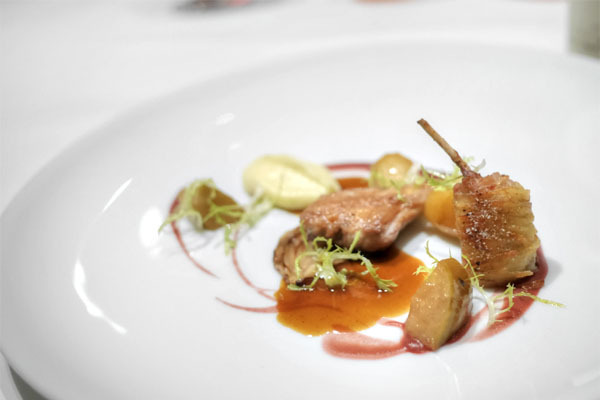 Quail was presented two ways. The breast was stuffed with foie gras and sous vide'd, but the hero was that leg wrapped in potato strings and flash-fried to a perfect crispness. Rounding things out were beet and potato purées, as well as hay-smoked apples, which imparted some rusticity to the dish. Suckling pig was delivered in no fewer than six preparations: a crispy confit'd pressed shoulder; a hammy loin roulade; a juicy, gritty crépinette made from hind leg mixed with foie gras and chestnut; an earthy-yet-refined black pudding; a well-charred chop; and a tender-crisp tête de cochon. Accompaniments comprised an apple cider reduction, tart roasted grapes, bitter salsify (which I found particularly effective), and date purée. 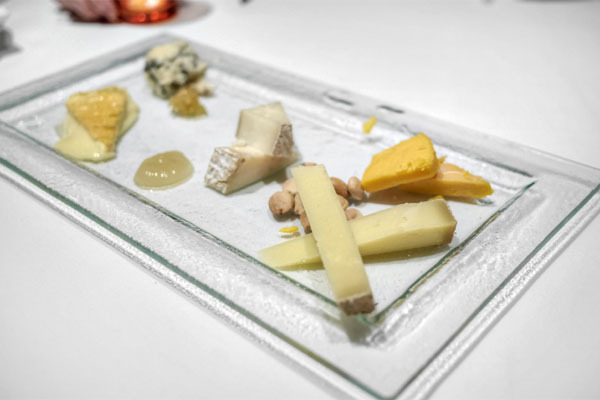 Beaufort - A raw cow's milk cheese known as the "Prince of Gruyére" that was on the nutty, grassy side. Hook's Ten Year Sharp Cheddar - Buttery and rich, robust, with lots of crispy calcium crystals. Casatica di Bufala - An Italian water buffalo cheese: soft, sweet, creamy, with a bit of mushroom-y musk. Douceur du Jura - A washed-rind cow milk's cheese. Gooey and salty and super funky, sort of in the same vein as Époisses. Rogue River Blue - From Oregon. Classic blue character: super pungent with barnyard notes and a sweetness on the back end. At this point, we got into the desserts, which are the work of Pastry Chef Andy Jin. An LA native, Jin first got into cooking at age five after baking with his mother. 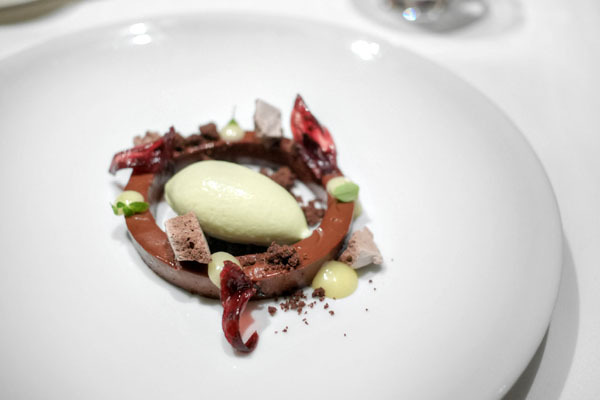 He attended the International Culinary Center in New York, graduating in 2010, and found work at David Bouley's eponymous Bouley, SHO Shaun Hergatt (where he really found his place in pastry), and the vaunted Eleven Madison Park under Angela Pinkerton (who's since left for Craftsman & Wolves). 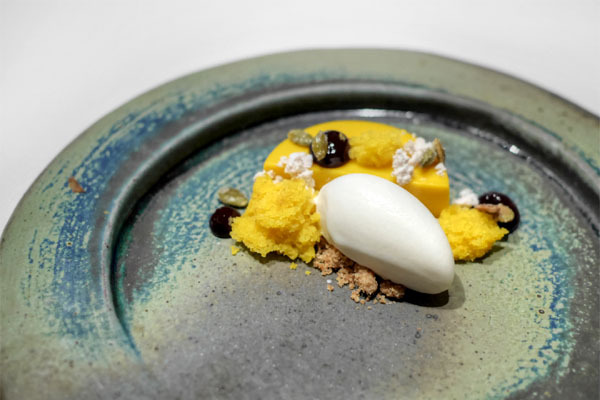 Jin eventually made his way back to the Southland, and started at Patina in May 2014. 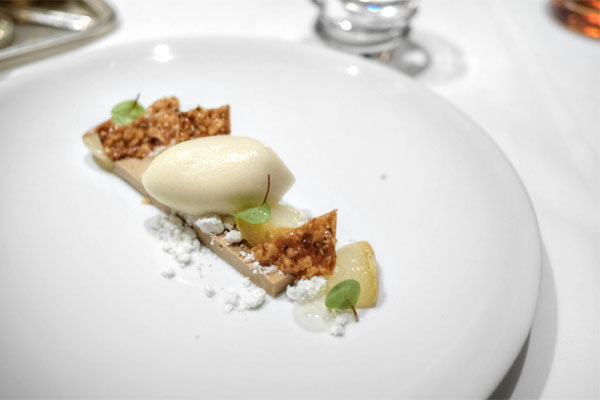 We began with the lightest of the desserts, one that featured intense, true-to-life flavors of pear complemented by lovely notes of autumnal sweet spice, the brittle imparting a great texture to the dish. Huckleberry made for arguably the richest berry flavors that I've ever encountered in a dessert, evened out by moderating notes of hazelnut. Fantastic textures, too. Bittersweet dark chocolate was the star here, underpinned by a persistent, prickly heat while hibiscus added a floral element to the mix. Great use of the avocado ice cream, which definitely lifted an otherwise hefty dessert. We ended with my favorite dessert of the bunch: sweet, but not too sweet, and really capturing the essence of the kabocha. Excellent, countering tartness from the currants, and I was a fan of the balance provided by the ice cream. Great spice from the crumbles, too. 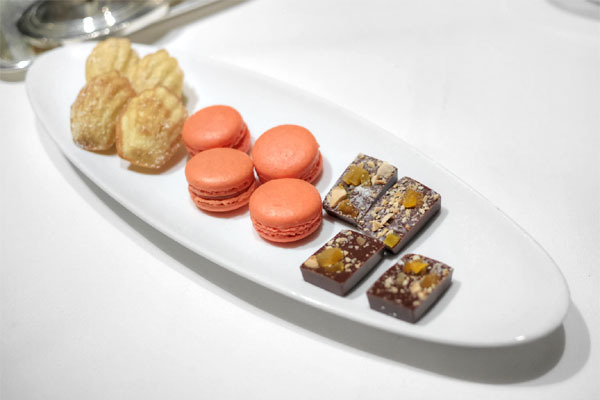 Lastly, mignardises comprised lemon madeleines, spicy-sweet cinnamon macarons, and dark chocolates laced with dried apricot and peanut. Overall, a very strong meal from Lee and the team, across all fronts. 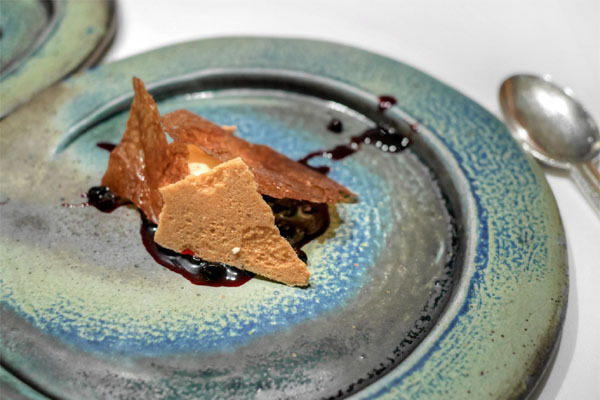 The cooking was just what it should be at Patina: rooted in French cuisine, but imbued with a modern, seasonal edge and lots of finesse and subtlety. The Chef's doing some great things, and I hope he's able to keep it up. It's actually been a while since I've had a classic fine dining type experience (mostly because there's been a lack of such openings as of late), and I miss it, so it felt great getting back into the fold. great review, thanks for sharing Kevin! What a great write up, Kevin. 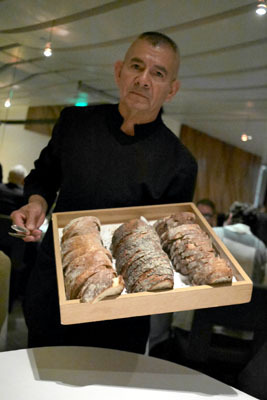 Loved the picture of the "bread sommelier". He is the best! Looks really great. How would you compare this meal to Providence? If you had to pick one dinner, where would you go?